Fresh off the news that Eataly had chosen Manulife Centre as its first Toronto home, another known brand has followed suit. Over The Rainbow, Toronto’s premier denim shop, is putting its new flagship location here as well. This makes us giddy for a few reasons. Firstly (and most importantly) their stuff is amazing. The jeans are great, naturally, and their knowledge about all things denim is arguably unmatched. But the real pot of gold is the attention Joel Carman and his team pay to accessories. There are beautiful belts, stellar shoes and – our favourite – a collection of funky socks. We’re especially drawn to the pair of sunny-side-ups (you’ll know it when you see it). Secondly, it’s such an honour for them to have chosen us – after all, they’ve been kind of a big deal around here for 40+ years. In the ’70’s, when Yorkville was transitioning from hippie to haute, Over The Rainbow was one of the first retailers to move in and they set the tone for what would eventually turn into the centre of Canadian fashion. For them to recognize what our redevelopment is going to do for the community – and to want to be a part of making it happen – is a huge vote of confidence for us, considering they were among the area’s trailblazers. Thirdly, the attention they’re going to bring to the other family run stores around here can’t be overstated. Bonny for luggage, De Catarina for leather and Nirvana for home furnishings have all called Manulife Centre home for years; and we’ve been proud to give them a place to be. Now, with Over The Rainbow in the fold bringing discerning denim shoppers in, more Torontonians will get to know the small businesses that help create the vibe here at the corner of Bay and Bloor. 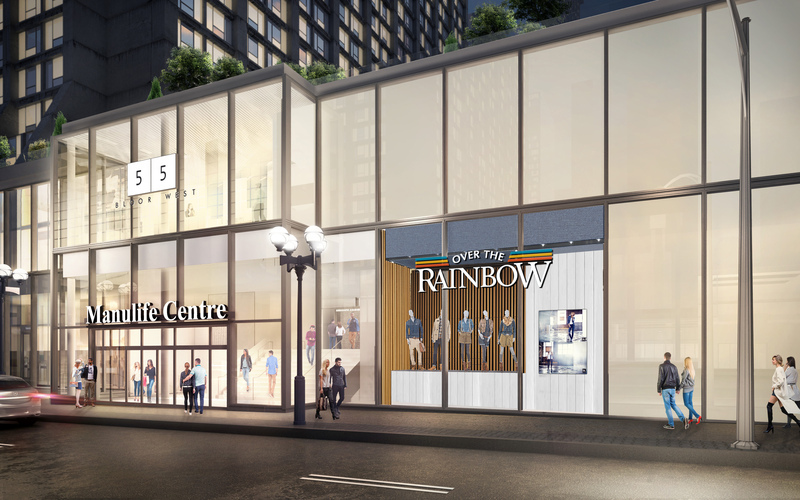 Over the Rainbow’s new flagship store is set to open in Manulife Centre towards the end of 2018. An artist’s rendering is included with this post.